There were many remembrances of Irwin's life. A few of them can be found here. 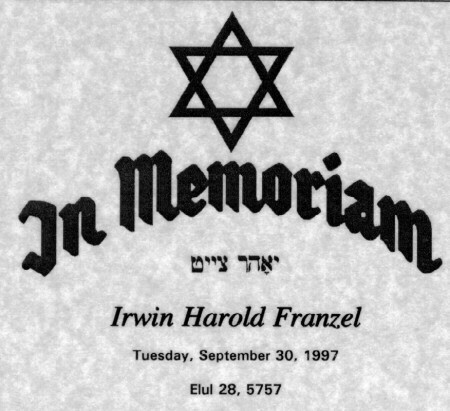 Franzel, Irwin Harold of Bradenton, Florida on Tuesday, September 30, 1997 in New Jersey, surrounded by his family. Born in Brooklyn, New York, August 14, 1924. Educated at Townsend Harris High School and City College of New York. Scientist, scholar and sailor. Founder and first president of New Milford Jewish Community Center. President and founder, Delta Rehabilitation, Inc. Beloved husband of Bernita. Son of Benjamin and Eva. Dear brother of Leila and Malcolm. Devoted father of David, Bruce, Kathy, Robin, Jonathan, Susan and Brian. Much loved father-in-law of Barbara, Cecilia, Jeanette, Eric, Coleen and Tina. Loving grandfather of Joseph, Johanna, Joshua, Sarah, Melina, Lauren, Julia, Christine and Katherine. Devoted uncle of Laura and Barry. Much loved by Stuart, Elizabeth, Eleanor, Cliff, Hugh and Charles. Contributions may be made in his memory to the American Heart Association. Services Sunday, October 5, 1997 at 2:00 p.m. at New Montefiore Cemetery, Farmingdale, Long Island, N.Y.
What words of comfort can I offer you that will lessen the pain. been put upon us all. To paraphrase Isaiah: "There are no words. There is no speech." quite as heavy but nevertheless it will be felt. now. This poem was appropriate then and certainly is appropriate now. Within it's fold birds safely reared their young. As if to say, Fear naught from life's alarms. To know this life was good. It left its mark on me. And so it lives. Such life no bonds can hold. dynamic personality, this wonderful mad genius, this loving, caring soul. years with him. How fortunate and blessed you are. His niece, Laura, and nephew, Barry. and, of course, his terrific grandchildren. how many are his blessings. safety from life's alarms. He gave you life. And this is the greatest gift of all. with creative energy as a brother, loving husband, nephew, uncle and cousin. But especially as a father and grandfather. sizeable volume of such stories with little overlap. might seem a bit fantastic to someone outside the family circle, but are all true. ever keep alive within us Irwin's memory, his character, his sense of humor. human being, we will keep in our hearts and souls. of our days, all that he has done will stand fast. And so he will live. Such life no bonds can hold. Irwin was one individual who gave much more of himself than he ever personally gained. Going back a long time, he served with distinction as a member of our Board of Directors for many, many terms. He fathered and developed our wonderful Tree Planting Project, an accomplishment which so aptly filled one of the aims of the United Nations. We admire him for his achievement in helping protect the earth's natural resources and the environment. He headed up a unique business called Delta Rehab, which made it possible for less fortunate persons to rejuvenate their lives. His long hours and caring efforts helped so many people who needed the help he saw that they received. Irwin unselfishly did much to make this a better planet, and we are proud that he served as one of our leaders. His loving wife, Bemita, also does tremendous work for the UNA, and we are very grateful. We extend our sympathy to her and want her to know that our loss is great also, not of the same magnitude as hers, but a loss that creates a void we cannot fill.